This entry was posted in Equipment and tagged equipment, fencing gear, Fencing.net on March 14, 2014 by A.B. Schafer. We’ve completed our first fundraiser, and thankfully we were able to raise some funds for the club. Now that we are past the Thanksgiving holiday and into the start of fencing season, we are in need of some bright ideas on what to do for our next fundraiser. So put on your favorite thinking cap and come up with some bright ideas. If your parents or friends have an idea of what we can do for our next fundraiser, please pass it on. We have a stiff goal to reach ($5,500), and we have quite a hill to climb if we intend to get equipment for competitions. We have some equipment loans which help us in reaching our goal. By borrowing the equipment for the season, we don’t have to raise as much money to purchase the equipment we need. Discuss it with your teammates, friends, family, cousins, etc. and let’s see what bright ideas we can put into action! If you have any questions about our budget and what we’re raising money for, contact any of the club officers or myself. This entry was posted in Club Business, Equipment and tagged fencing gear, fundraising, High school fencing, members, organized sports on December 3, 2013 by A.B. Schafer. This entry was posted in Club Business, Equipment and tagged cinnamon rolls, equipment, fencing, fundraising, money, schedule, this is for you and the club on November 9, 2013 by Sarah Motley. Please download and print the file. Once you have all the pages filled out and all the signatures, turn in the form to Coach Schafer as soon as possible. As always, if you have any questions, contact Coach by email or by phone. See you at practice on Tuesday! This entry was posted in Club Business, Equipment and tagged Clubs, fencing, High school fencing, members, membership, United States, USFA on October 14, 2013 by A.B. Schafer. I’ve taken the time to do some comparative shopping for everyone. Attached to this post is a chart of vendors and the different sets they offer for beginning electric equipment. The chart is grouped according to weapon type. There are some obvious deals (cheap prices), but it all depends on what you can and want to purchase at this time. If you intend to continue with fencing next year, I would suggest you consider buying a set that will provide you with the minimum USFA requirements for competitions. Why two weapons? Murphy’s Law runs rampant at meets and competitions. With the use and abuse that weapons go through during the course of a bout or competition, it is not uncommon for a weapon to fail or get damaged. (Sarah would be happy to recount her experience with this for you!) If that should occur, you would be given a limited amount of time to come up with a replacement weapon (but not enough time to repair it). If you do not have a back-up weapon, you will be forced to forfeit the bout. Click the link below to download the electric starter sets information (PDF) When ordering sets, there are often multiple options based on the type of weapon (type of point, type of grip, etc.). If you have any questions about equipment, please do not hesitate to contact me (phone, text, email, FB, comments on this blog). This entry was posted in Equipment and tagged épée, equipment, foil, glove, jacket, mask, penalties, saber, starter set on March 20, 2013 by A.B. Schafer. Discounts: Absolute brand gear – 20% off; European brands (except Leon Paul and Negrini) – 15% off; Leon Paul and Negrini brands – 10% off; Starter sets – 5% off. Ordering Method: Orders must be placed through Coach. Discounts: Start at 10% and go as high as 30% retail prices; Items already on Sale and discounted Sets are not eligible for additional discounts. Discounts: 10% off all regular retail prices (clearance, sales, and starter sets are not included). Ordering Method: Order directly online and include note in comment box to please include discount for the Harrison High School Fencing Club. Orders can also be placed through Coach. Discounts: No discounts but their uniforms are made in the USA; can make custom-fitted uniforms. Ordering Method: Order directly from Triplette. Discounts: 20% off house brand individual items; 15% off German (FWF) items; no discounts on starter sets. Discounts: 10% off their standard equipment (made in China). Once you’ve determined what gear and equipment you want that needs to be ordered through the Coach, fill out our ordering form or email your list of items to the Coach. As always, if you have any questions contact me. This entry was posted in Equipment and tagged épée, chest protector, equipment, equipment bag, fencing gear, foil, glove, jacket, knickers, mask, plastron, saber, shoes, socks, starter set on January 20, 2013 by A.B. Schafer. I’ve heard back from Absolute Fencing, and we qualify for the discount now. This will mean that if you want to receive the discounts they are offering, the order will have to be placed by me as the Coach. We will have to work on a case-by-case basis on how you can pay for your order. Since sets are already discounted, we can only get 5% off any set ordered. Let me know via email or in person if you would like to place an order. Here’s the outline of the process for placing a club order. Please note that club orders are only available to members of the club. Coach Schafer will compile everyone’s orders into a single shopping list and submit it to Absolute Fencing Gear Inc. for pricing. 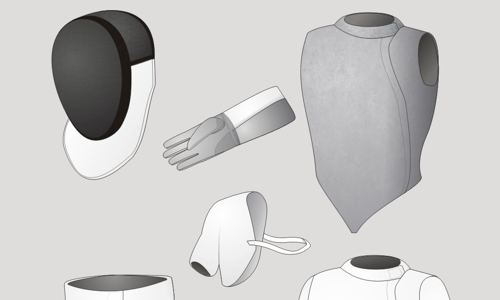 Absolute Fencing Gear Inc. will review the club order. They will check their inventory and based on the item or how many they have in stock they will apply a discount on the items. Once they have priced everything they will send an invoice to the club. Coach Schafer will email the invoice to the members that ordered equipment along with a spreadsheet indicating how much each member owes. Each member writes a check (make payable to “Anita Schafer”) in the amount they owe. Once all of the payments have been collected Coach will place the order using the club account with Absolute Fencing Gear. It usually takes 2 – 3 days for the equipment to arrive and can be picked up at practice. This entry was posted in Equipment and tagged épée, foil, glove, jacket, mask, saber, shoes, starter set on December 4, 2012 by A.B. Schafer.